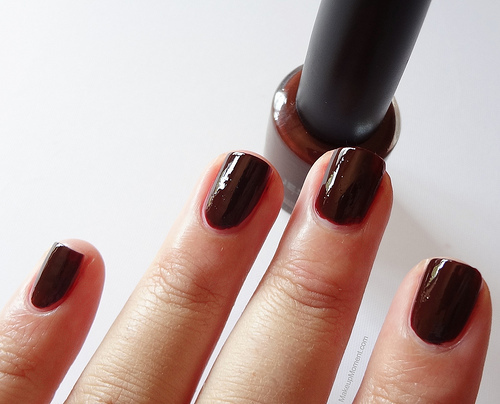 With fall and winter right around the corner, I can't help but be drawn to nail colors that have a deep, rich hue to them. I was browsing the beauty isle over at T.J. Maxx a few weeks ago and I happened to spot this adorable mini nail set by Jessica. Jessica's Heritage Collection ($6.99) is comprised of four fall/winter appropriate nail shades, as well as a clear top coat to amp up the shine and add the perfect glossy finish. Let's take a closer look at these four beauties! Double Dipped: Creamy Chocolate Brown. I just can't get over how amazingly rich the brown coloring is. It is a real stunner that everyone can get away with. Colors like this one are a classic staple for the autumn months. The first coat went on a bit uneven and streaky. Everything evened out with coat numbers two and three. Solar Eclipse: Deep, rich creamy navy. I have tried my fair share of navy nail colors in the past, but I don't recall any of them having a true, inky navy hue like this one does. They usually lean more towards black, since the navy tends to disappear. I really like this one and I just know that I am going to be sporting this nail color loads this fall. The first coat went on uneven, and streaky. But the second and third coats did the trick to pretty everything up. 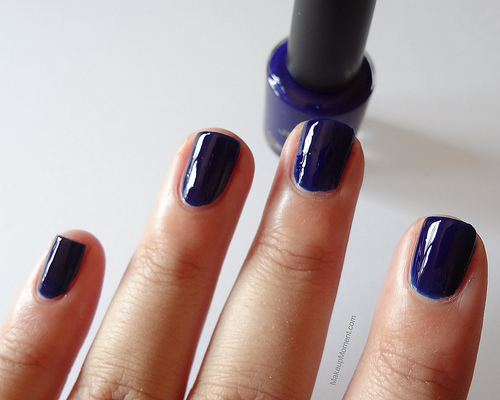 Also, make sure to wear a good base coat under this one, as the navy color does tend to stain the nails a bit. Vineyard Pinot: Jewel-toned red, with golden shimmer. This is definitely my most favorite one of the bunch. The swatch picture does not do this beauty any justice. Believe me, the color is much more stunning in person. I know reds like this one are pretty common, but there is something about Vineyard Pinot that I love. When I first applied this nail color I immediately knew that it was going to be my preferred nail color to sport for upcoming holiday parties. I think it's the rich jewel-tones that add that perfect glam touch that we all can't seem to get enough of when the holidays roll around. Vineyard Pinot applied beautifully! One coat yielded even, opaque coverage. But as per usual, I added a second for good measure. Rainbow Red: Shimmered red with a hint of fuchsia. This is a pretty color that is always nice to have around, and the fuchsia touch makes for a nice, unexpected surprise. Like Vineyard Pinot, this one provided a pleasant application experience. You could easily get away with one coat, but I applied a second. Overall: I really enjoyed all four nail colors in Jessica's Heritage Collection nail color set. They were all very easy to apply thanks to the high quality rich formula, and they each gave off a beautiful, shiny finish (I didn't apply the included top coat over the nail swatch pictures because I wanted you all to see just how beautiful of a finish these imparted on their own-but they do become extra glossier with the top coat over them). Drying time wasn't too bad with these, but the brown and navy creams definitely needed a little bit longer to fully dry, than the two reds did. I haven't properly tested these out for wear-time, but they look to be very promising in that department. If any of you spot this nail set at T.J. Maxx, I suggest picking it up. The colors are fantastic for fall and winter, and you just can't beat the affordable price. What do you all think of the nail colors in Jessica's Heritage Collection? Which are your favorite Jessica nail colors? Such beautiful shades! I think double dipped is my favourite for this time of year. Double Dipped is beautiful. I'm going to be visiting all my local TJ Maxx stores this weekend now. I hope I find this set!